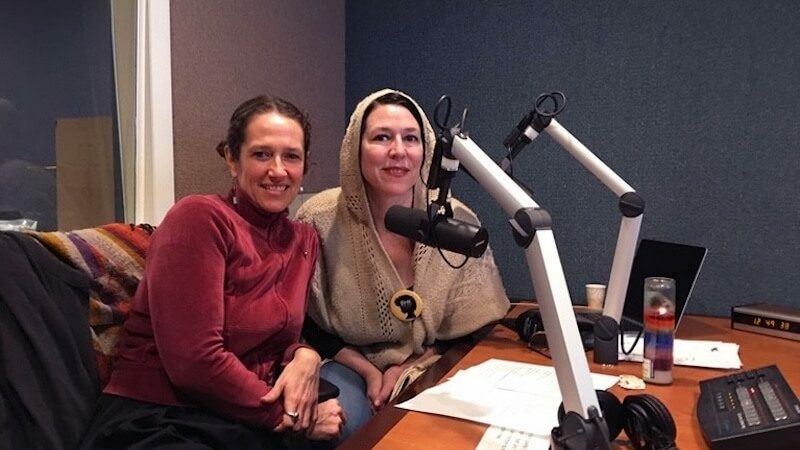 Co-hosts Theresa Lyn Widmann and Shana Falana longed for a program where women shared experiences and could better understand each other. While the title of the radio program I Want What SHE Has might suggest that it’s about envy, that was not the intention of co-hosts Theresa Lyn Widmann and Shana Falana. According to the longtime friends, the program is about women deciding what they want in life and deriving inspiration from other women’s stories. The title was prompted in part by Falana’s own experience in 12-step programs, where a person chooses a sponsor by finding someone whose achievements they admire and using them as a model. Besides performing with Shana Falana, an experimental dream-pop band, Falana also paints houses and volunteers in the recovery field, taking 12-step programs into rehabs and jails. Widmann hopes the program’s interviews with interesting women will encourage listeners to look at their achievements, not with envy, but as a resource and source of inspiration. The founder of Kingston’s Anahata Yoga and Healing Arts, Widmann started her work life as a practicing attorney. Her frustration with the legal community led to work in technology, which she described as profitable, but “soul sucking,” and eventually a mid-life crisis move to the Hudson Valley in 2013, where she now teaches yoga and serves on the board for Kingston’s O Positive festival. Widmann and Falana were planning to do a podcast before a friend suggested WKNY, now known as Radio Kingston. WKNY first went on the air in 1939, broadcast from Kingston High School’s auditorium, and had a dozen different owners before Radio K Corporation bought the station in October of 2017. It became Radio Kingston WKNY 1490 AM on Nov. 1, 2017. The commercial station became a non-commercial station centered on community. The first task for executive director Jimmy Buff, former director of WDST Woodstock, was scheduling new programming that reflected as much. Since January 1, the station has added 20 shows, reflecting a range of community interests. “What makes radio really relevant in a market like Kingston is when we are hyper-local as we’ve become,” said Buff. Since I Want What SHE Has began broadcasting in January, guests have included speakers on domestic violence; feminist filmmaker Kat Hunt; David Bowie band member Gail Ann Dorsey; musicians Marisha Chinsky and Ruth Ungar; musician, zine publisher and yoga teacher Taleen Kali; and Ashley Knox, director of Go Beyond Greatness, an educational program that supports young people working to reach their goals. One subject that continues to fascinate Falana is the often unexpected path that some people take to reach their goals. While Widmann says it’s a coincidence that the timing of their program, highlighting women’s voices, dovetails so neatly with the ascendance of the #MeToo movement, both women were encouraged by the Women’s March on Washington, which happened a year before the show’s debut. Falana enjoys listening to podcasts while painting the interiors and exteriors of houses. She longed for a program where women shared experiences and could better understand each other, so she co-created one. I Want What SHE Has airs from 1 to 3 p.m. Wednesdays. The upcoming guest list includes women health and wellness experts, artists, writers and more musicians. Previous shows are archived on the Radio Kingston site.